Faf de Klerk and Malcolm Marx have been nominated for the 2018 World Rugby Player of the Year award. 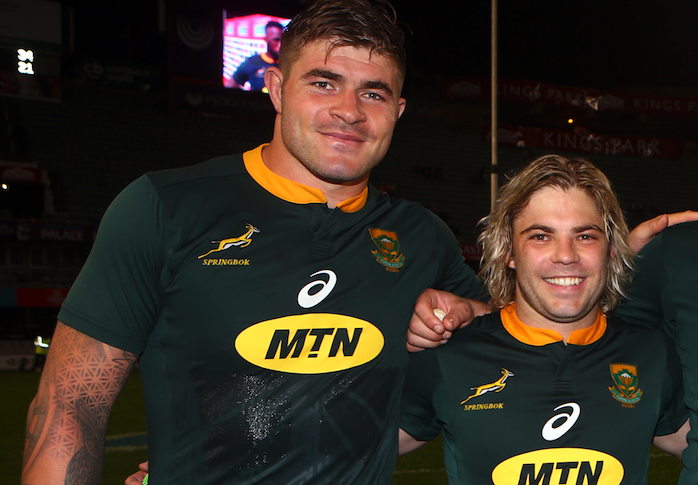 De Klerk played almost every minute of the Boks’ Rugby Championship campaign, scoring tries against Argentina and Australia and proving a constant thorn in the side of his opposite numbers across his nine starts. Marx has played the fewest Tests of the nominees with only six, having missed the Wales Test and series win over England in June through injury. He had an excellent Rugby Championship, combining athleticism, power, pace and a wide skill set in attack with the breakdown skills to turn over many a ball for the Boks. The other nominees for the Player of the Year award are New Zealand flyhalf Beauden Barrett and wing Rieko Ioane, and Ireland flyhalf Johnny Sexton. Barrett could become the first player to win the prestigious accolade three years in a row after another impressive season in the All Blacks No 10 jersey. Ioane, who won the World Rugby Breakthrough Player of the Year award in 2017, is the top scorer in Test rugby in 2018, crossing for 11 tries in his eight starts to take his career tally to 22 tries in 21 Tests. Sexton won all the competitions he played in last season, as Leinster claimed the Pro14 and European Champions Cup titles and Ireland were crowned Six Nations champions. The winner will be revealed at the World Rugby Awards in Monte Carlo on 25 November.